For some people, safety and form during a workout is a huge priority. For others, it’s an afterthought. If you work out without the careful eyes of a trainer or instructor watching your every move, it can be difficult to know if you are exercising with proper form—even when you’re really trying to. Learning how to move with correct alignment isn’t just about looking good; it can mean the difference between muscle activation and joint strain—or even injury. Here are five exercises that are common—and may even seem simple—but are most often performed incorrectly by people of all fitness levels. Fix Your Form: Line up your palms on the floor directly under your shoulders and brace your abs into your spine as you extend into plank. Press your arms into the floor and imagine you are lightly gripping the ground with your fingertips to engage your wrists. Your body should be in one straight line (diagonal with the floor) from your heels to your hips to your head. TIP: Imagine you are holding a grapefruit between your chin and your chest to help keep your neck neutral. Fix Your Form: Begin in a wide split stance (one foot in front of the other) with your bodyweight centered between your legs and your back heel lifted (not pictured). Bend both knees about 90 degrees and lower your body straight down, keeping your spine neutral (shoulders stacked over your hips) and back knee underneath your torso as it bends. Fix Your Form: Clasp your hands behind your head lightly and relax your head into your hands to keep your neck lengthened. Open your elbows wide to the sides and curl up over the top of your ribcage, looking forward with your eyes so that your chin comes slightly to your chest. Relax your legs and glutes and keep your pelvis parallel to the floor (envision trying to balance a wine glass on top of your belly as you crunch). Fix Your Form: Keep your back neutral (there should be a slight natural curve in your lower back), chest lifted. When you bend your knees, press your hips behind you (as if you were going to sit back into a chair), tracking your knees over (but not past) your toes, with your feet and knees pointed forward. Lowering further than you are able to with proper alignment of the body (as listed above). Fix Your Form: For a traditional push-up, try to line up the midline of your chest with your thumbs, keeping your hands under your body and wide enough that you can lower your chest straight down in between your hands. Keep your hips in line with your spine (similar to the plank, your torso should form a straight line from your shoulders to your hips to whatever point, knees or toes, is in contact with the floor). Look down to the floor with your eyes—not by bending your neck—to avoid neck strain, keeping neck in line with the spine at all times. Only lower down as far as you can with proper alignment. If you noticed that you’re guilty of even a few of these form guidelines, don’t beat yourself up over it. The key is to continue to improve and focus on that form. Proper form is essential to target the muscles you’re trying to train while also avoiding injury. So enlist the help of a friend, use a mirror when you can, or consider getting help from a personal trainer for even more insight. Are you guilty of any of these common mistakes? What specific exercises do you have troubling maintaining proper form with? Whether you’re looking to count your daily steps, keep track of your sleep habits or see how many calories you burn in a workout, a slew of new devices aim to offer everyone from athletes to average Joes more insight into the details of their lives. These gadgets, called fitness trackers, have increased in popularity in recent years, and are showing no signs of slowing down. The devices often work together with smartphone apps and websites to help you view your activity, set health goals, share your achievements with friends and sometimes provide extra motivation to get off the couch. Live Science reporters have tested all of the fitness trackers listed here, and ranked each in four categories — Design/Comfort, User-Friendliness, Value of Information and Enjoyment/Inspiration. We’ve reviewed them, and can give you a look at the pros and cons of each device, as well as how it stacks up against the competition. Choosing the right fitness tracker depends on may factors, including the seriousness with which you approach fitness, exactly what you want to track, how much you want to spend and how discreet or flashy you want the device on your wrist to be. Below is the overall rating for all the devices we’ve reviewed, along with summaries of our reviews to help you pick the right one for your lifestyle. The Basis Peak is a fitness tracker that automatically detects what you are doing, such as running, cycling or sleeping. The Peak continuously monitors your heart rate, and is water-resistant enough that you can take it swimming. The company says that with a coming software upgrade, the Peak will soon have some smartwatch capabilities, such as notifications for incoming calls. Like the previous Basis trackers, the Peak excels at motivating you — it uses a point system, and gives you an explanation for why you should work toward each of several “habits.” The cons are that the device is a bit bulky, doesn’t have an alarm and is not GPS-enabled. The Jawbone UP Move fitness tracker will track your steps taken, distance traveled, calories burned and hours slept. With the ability to personalize your goals, and get reminders to help you work toward them, our reviewer found that the UP Move provides a lot in the motivation department. The Live Science testing team picked the Jawbone UP Move as our “Best for the Money” tracker for a few reasons: At $49.95, it’s about half the price of the Fitbit One and the Polar Loop. In addition, the although the UP Move’s price is comparable to that of the Fitbug Orb, the Orb is a bit bulkier and doesn’t have an alarm, nor does it have as many social media capabilities as the UP Move. Because it boasts a handful of smartphone features, the Fitbit Charge stands apart from ordinary fitness trackers. This device costs about $130, tracks all of your usual metrics and will even display incoming calls to your phone right on your wrist. We found these call alerts to be handy during workouts, limited in usefulness: You’ll still need to pull out your phone to actually take a call. The tracker is more comfortable to wear than most, and unlike some of the other options from Fitbit it has a small display screen. But the Charge is not waterproof and does not have a heart rate monitor. The TomTom Runner Cardio is designed for runners — it has both a heart rate monitor and GPS capabilities that let it track data such as your distance, time, pace and speed. The Live Science testing team determined that this device is also the best overall tracker because it not only has the advanced features of a heart rate monitor and GPS, but it is also supremely easy to use. It has a single, large button that makes it easy to scroll through your data, even on the fly. You can also wear it while swimming. The accompanying MySports app will create charts of your data over time, and also lets you set your own goals for distance, time or calories burned, sending you text alerts to help you work toward them. However, at about $270, the Runner Cardio is pricier than other fitness trackers, and it doesn’t track your sleep. The Moov fitness tracker stands out from the competition because it not only tracks the same data as most fitness trackers — steps taken, calories burned and the amount of time spent working out — but it also provides spoken instructions through your headphones on how to improve your form or sustain certain movements while exercising. The device, which costs $79.95, can be worn on your wrist or ankle, and is water-resistant enough that you can take it swimming. The Moov does not track how much time you spend sleeping, and it has no screen, so users must look at a smart phone or tablet to see their stats. The Pop is a fashion-forward fitness tracker that comes in three colors and looks like a regular watch. It tracks your daily steps taken, displays your progress toward you daily goal right on the watch face and automatically goes into sleep mode when you hit sack. The device is waterproof, so you can take it swimming, and it runs on a watch battery, so it does not need to be charged. At $150, the Pop is the more-affordable version of Withings’ previous fashion-forward fitness tracker, the Activité, which costs $450. Withings recently redesigned its HealthMate, making it easier to see all of your stats. The Pop does not track heart rate. The Orb is a fitness tracker that tracks your steps taken, distance traveled, calories burned and quality of sleep. The main selling point of the Orb is its price: At $49.95, it’s about half the price of the Fitbit Flex and the Polar Loop. The main advantages of the Orb are that there are more ways to wear this tracker than with many other trackers on the market, and users receive emails and notifications with tips that provide you with meaning behind the information it tracks, as well as suggestions for improving your health. However, the wristband lacks a screen interface, and requires you to put the battery in yourself. The battery needs replacing every four to six months. The Adidas Fit Smart is a tracker aimed at people who are training for a race, or who want to stay in shape for a sport. The app lets you create your own training schedule, and the device can even coach you during your workouts, alerting you to when you should pick up the pace. It also includes a heart rate monitor, which not all trackers do. However, the Fit Smart does not track your calories or sleep, and is not meant for use during swims. The Fitbit One, at $99.95, is in the mid-level price range for fitness trackers. It tracks all the basic metrics, including sleep, steps taken, distance walked and calories burned, and also counts the number of floors you climb. We gave the One high scores for its small size, the way it lets you connect with friends, the alarm that you can set, the inclusion of a wireless dongle to sync with your computer and a lower price than trackers such as the Garmin Vivofit. It does lack certain features found in higher-priced fitness trackers, such as the ability to track cycling, a capability of the Basis Carbon Steel Edition. Also, the One’s sleep graph is somewhat difficult to navigate (and the device tends to count “steps” while you’re asleep). The Garmin Vivofit is marketed as a device that can help you turn your daily exercise into a healthy, lifelong habit. In addition to logging the standard fitness-tracker data — including steps taken, calories burned, distance walked and hours slept — the Vivofit assigns you a personalized fitness goal, which adjusts itself daily, as the device learns your habits and milestones. We experienced some issues syncing the device to a computer and phone, but the Vivofit’s one-year battery life definitely sets it apart from other fitness trackers currently on the market. The Fitbit Flex wristband ranked highly in comfort and design. The tracker’s soft, rubbery band is comfortable and easy on the eyes. We found it among the most inspiring and enjoyable of the fitness devices we’ve reviewed, in part because the wirelessly connected app provides a lot of data to allow you to work toward your goals and monitor your progress. Although it can be a little clunky to use, the Flex does a good job motivating you with goals for daily distance and activity time. Note that another well-known fitness tracker from the company, the Fitbit Force, was recalled in February 2014 after users experienced allergic reactions to the nickel in the device. The Fitbit Zip is an economical fitness tracker, priced at just $59.95. This basic device tracks steps taken, calories burned and distances walked, but does not track sleep time or stairs climbed, nor does its screen light up. Through its app, the Zip provides a fair amount of motivation to get you moving. The Polar Loop is one of few fitness trackers on the market that is truly waterproof, allowing users to track activity while swimming laps. (The other is the Misfit Shine.) We found the Loop to be very comfortable (when you first get it, you cut the band so it fits your wrist), easy to use and simple to sync with the iPhone app and computer software. The biggest drawback we found is the button used to display the time and activity data, which is small and sits low in the band, making it difficult to push. Although the Loop measures the basics of sleep time, steps taken, activity time and levels, and calories burned, it does not give you any details on sleep quality, nor does it let you input calories eaten. The Jawbone UP24, a newer version of the original Jawbone UP, stands out from other fitness trackers in that it provides useful data on several aspects of your daily routine, it’s easy to operate and it allows you to scan food barcodes. Depending on your style, you might find the UP24 among the more fashionable tracker wristbands. However, for those who like to check their information without having to access their phone, the UP24 may not be for you, as it doesn’t have a screen. In addition, frequent swimmers and people who live or work near water may want to look for a water-resistant tracker like the Misfit Shine or Polar Loop. The LifeTrak Brite R450 aims to provide a comprehensive view of health and fitness. Not only does it track daily steps, distance, calories burned, heart rate and workouts, it also automatically detects when you fall asleep and wake up. And unlike many fitness trackers on the market, the Brite R450 also monitors light exposure, including exposure to blue light. The device will notify you when you’ve been inside too long and need to get more natural light. And the Brite R450 can send you alerts when you get an incoming call, text or email, and is waterproof up to 90 feet, so you can wear it swimming. The device’s app can show you more information about your daily activity, but syncing with the app proved frustrating – it took several minutes to transfer data from the device to the app. And although the Brite R450 tracks light exposure, it provides very little information about what to take away from this data, leaving us wishing that the device made better use of this feature. Garmin’s Vívosmart tracks steps taken, calories burned and distance walked. You can also use the device to track your sleep. And since this fitness band is also part smartwatch, it lets you read texts and other notifications from your smartphone right on your wrist. But these smartwatch features will cost you. Vívosmart goes for $169.99, which is significantly more than what you’d pay for a fitness tracker with more basic functions. We experienced a few problems when trying to sync Vívosmart with a smartphone, but the device did prove effective at getting us up and moving throughout the day. The Runtastic Orbit is a fitness tracker that monitors both daily activity (steps, calories and distance) as well as your sleep habits. At about $120, the Orbit is in the mid-level price range for fitness trackers. The Orbit has a few advantages compared to many other fitness trackers, including that you can set the device to vibrate to alert you if you’ve been sitting still for too long, and it’s waterproof, so you can wear it swimming. However, in our experience, the Orbit came up short in several areas. The device and accompanying app provide little information about what your statistics mean. (For example, there is no information about how much activity you need in a day to be healthy.) And although the device claims to track happiness and ambient lighting, these features appear to be in a primitive form, and there was no information on how to use these features. But if you are a user of other Runtastic products, you may find the device useful, because it can pair with the general Runtastic app, which tracks workouts. The Microsoft Band is a fitness tracker that includes some smartphone features, such as the ability to read email, texts and other reminders on your wrist. The device is also one of the few fitness trackers that has GPS capabilities. The band tracks your heart rate, steps taken, calories burned and the quality of your sleep, and also offers a guided workout feature. But despite its whistles and bells, in our review, the Band seemed to come up short on comfort. It pairs with the Microsoft Health app, which works on iPhones as well as on Android or Windows phones. At $269, the Microsoft Band is at the higher end of the price range for fitness trackers. The Nike FuelBand SE is an update to the original version of the FuelBand, and includes a few new features, including the ability to set reminders to move. You can also create “sessions,” which let you track the Fuel points you earn during a specific activity, like an afternoon run, as well as the duration of the activity. But the device provides little information about how much activity you need to be healthy, and does not provide sleep analysis. The Go is a fitness tracker from Soleus that tracks daily steps, calories burned, distance traveled and sleep quality in addition to workout time and pace. The tracker also includes a few smartwatch features, such as alerts when you get a call or text. Two appealing features of the Go are that the device vibrates to remind you to move, and users have the option to set the device to automatically enter sleep mode at a certain time. However, Soleus provides little information about what your stats mean, and the charging device is cumbersome. In addition, users need to press buttons on the device multiple times to find certain information, such as daily steps. The Misfit Flash is a basic, budget fitness tracker that usually retails for between $34 and $50. The device is waterproof, and may appeal to people who want to try out the whole activity- and sleep-tracking thing without spending a lot of money. You can wear the flash several ways — on your wrist, clipped onto your belt or dangling from your keychain — and the device will tracker your distance traveled, calories burned and hours spent sleeping. The Misfit app features a point system that brings in all the data on your running, swimming, cycling and other sports into a single number that lets you see how active you are everyday. In our testing, the Flash lost points because its wristband seems to break rather easily, and because in lieu of a watchface or liquid crystal display, the tracker has only a circle of tiny lights, making it difficult to interpret your data. Just because you leave the doctor’s office empty-handed, it doesn’t mean you have a clean bill of health: Most people with prediabetes aren’t given treatment for the disease, new research from the University of Florida found.In the study, 34 percent of people ages 45 and older were found to meet the criteria for prediabetes. That means their levels on the A1C test—a measure of your average blood sugar levels over the past two to three months—were between 5.7 and 6.4 percent.In comparison, a normal reading is below 5.7 percent, and a level of 6.5 percent or higher indicates full-fledged diabetes. But of the people who had blood sugar levels in the prediabetes range, only 23 percent of them received any kind of treatment for it. “The doctors may be more focused on treating diabetes, not something that may lead to diabetes,” says study author Arch Mainous, Ph.D.
That’s bad news, because treating prediabetes—either with drugs like metformin or through a weight loss program incorporating healthy eating and exercise—is very successful at preventing or delaying the development of diabetes, he says. And by preventing diabetes from occurring, you can stave off the serious implications of the disease, including damage to your kidneys, nerves, eyes, and heart, he says. Your move, then, is to take a more active role in your own health. Current guidelines by the United States Preventive Services Task Force recommend that all adults over 40 who are overweight or obese get their blood sugar tested. Instead, inquire ask about what your levels actually are. If they fall into the prediabetes range, ask your doctor point-blank what you should be doing to get your levels back to normal, says Mainous. You don’t necessarily need to jump right to meds, either. Your doctor can start you on a diet and exercise plan—a mixture of cardio and resistance training for 150 minutes a week is best—to see if that brings your levels down enough first, he says. Everything you do burns calories—breathing, sleeping, standing, and all of the active pursuits you enjoy. But what does it take to burn just 100 calories? You may be surprised by how little—or how much—activity you have to do to achieve that goal! To put it all in perspective for you, we’ve gathered 50 different ways to burn 100 calories. From standard exercises you do at the gym, to everyday chores around the house, you can burn 100 calories in just a few short minutes of your day. Keep in mind that not all movement is created equal. In order to classify an activity as a cardio ”exercise,” you must be working at 60-80% of your maximum heart rate. (You can calculate your target heart rate here.) However, even though periods of less intense activity may not count as part of your workout, they still provide health benefits and burn extra calories. After all, the less sitting you do, the better! Were you surprised by the amount of time it takes to burn 100 calories? Which of these activities can you incorporate into your life to burn an extra 100 calories per day? Pick one that fits into your schedule and go for it! If you like to take your time in the morning and savor every bite (or sip) of your breakfast, you’ll definitely be into smoothie bowls. 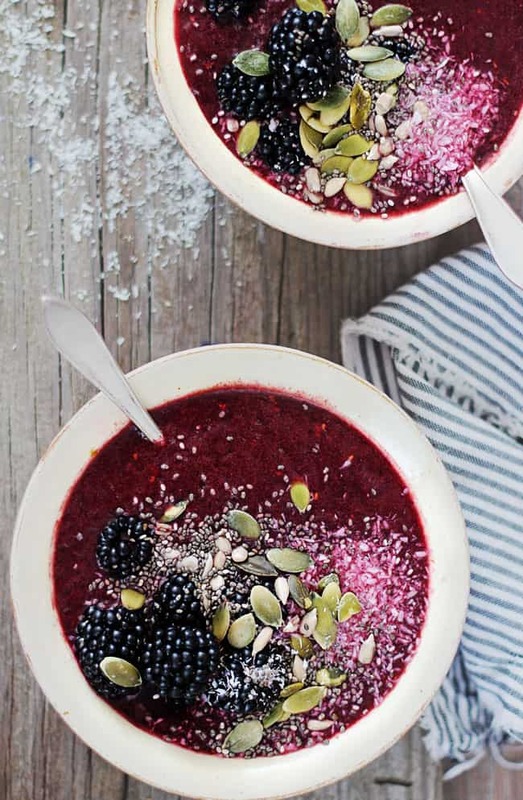 No matter which one you choose, a smoothie bowl for breakfast is the perfect way to kick-start your day, energizing your body with tons of nutrients. So what is a smoothie bowl? It’s a normal smoothie, only served into a bowl and ready to be enjoyed spoonful by spoonful. Often they’re a little more substantial than a sippable smoothie and include healthy doses of greens, fruit, milk or yogurt (dairy or vegan versions), healthy fats and a superfood. Learn all about how to make a smoothie bowl—and get dozens of flavor-combination ideas—over at Oh My Veggies. As berries of all kind are in full season now, packed full of incredible antioxidant and cancer-fighting benefits, I use them in smoothies every day. 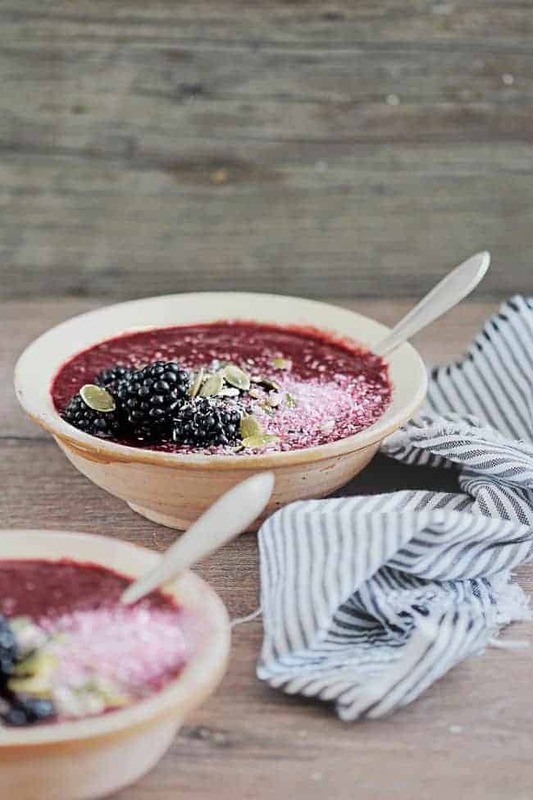 This blackberry-coconut smoothie bowl has became my favorite breakfast lately. 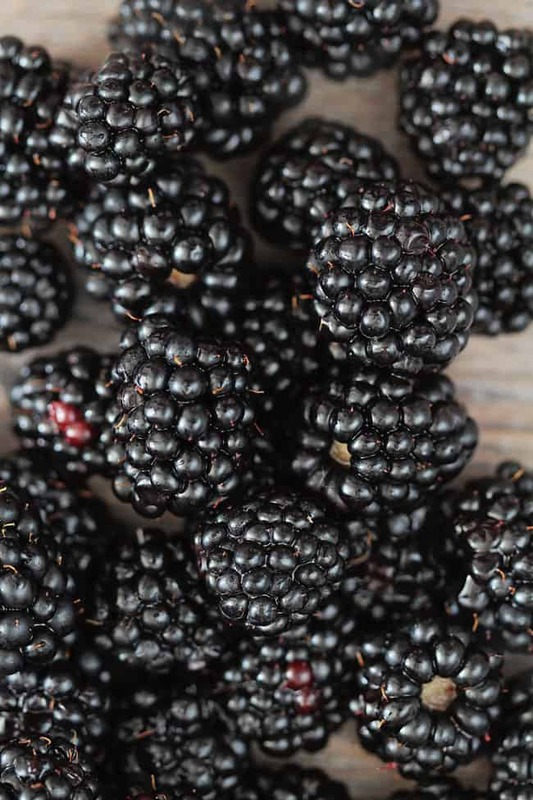 I’m in love with the glossy black color of the berries and I like the creaminess of coconut milk, but this is my go-to breakfast most of all because it’s nourishing and energizing enough so I don’t need any other snack until lunch. And, I must say, it’s delicious! The recipe is very simple. Boil 2 cups of water in a pan. Remove from heat and add 3 Tablespoons of fresh thyme. Let steep for at least 10 minutes, or until cool. Stir in the honey. Continue stirring until dissolved. Strain out the thyme, if desired, and transfer to a glass jar. Keep refrigerated for up to 2-3 weeks. This core workout may be short on time, but it’s high on intensity. Fitness instructor John Godfrey strategically builds in some rest time so you can push through to the end, but trust us, you’ll feel the burn once it’s over. After a quick warm-up, you’ll do a combination of moves such as planks, crunches, and twists that target your abs from every angle. The best part: All you need is a mat, which means you can do these moves nearly anywhere. Just press play! To recap, perform a 5-minute warm-up followed by the moves below. Perform each exercise for 8 to 10 reps. If you’ve decided to join the ranks of treadmill owners, there are a number of factors to consider to ensure that you purchase a machine that meets your needs. There are a multitude of treadmills on the market with prices ranging from $299 to $4,000. You are likely to find that a treadmill’s cost directly reflects its quality. Before you leave your home, measure the space in which you’d like to keep the treadmill. While the average treadmill measures 64 inches long and 28 inches wide, there are machines that fold up to be stored under a bed or in a closet. Drive to the nearest fitness-equipment speciality store where the staff will be knowledgeable and you can choose from a wide variety of machines. Wear a comfortable pair of athletic shoes — the same pair you’ll wear as you exercise on the machine at home. First, look at the treadmill’s motor size (measured in horsepower) to determine the machine’s longevity. Some manufacturers measure horsepower at continuous duty (the motor’s ability to function under a load for an extended period of time), others at peak duty. Look for a motor with a minimum 2.0 continuous-duty horsepower, which will accommodate users who weigh more than 180 pounds.Next, examine the treadmill’s belt and deck. The belt should be at least two-ply, 17 inches wide and 49 inches long. The board thickness should measure at least an inch. The deck acts as a cushion for the joints, legs, back and feet. The most sought-after treadmills feature low-impact decks that flex under the user’s foot plant to absorb the shock without rebounding to cause additional jarring. This feature is essential for individuals with shin splints and foot and back problems. A sturdy frame supports the belt and deck system. Treadmills that cost between $399 and $1900 usually have a steel frame; treadmills with a price of $1900 or higher often are constructed with aircraft aluminum frames that offer additional flexibility for impact absorption. Aluminum frames don’t rust or corrode and are lighter and easier to move. Lower-priced treadmills offer basic programming for variable speed, time, distance and calories. However, they seldom utilize user information, and the calorie counters aren’t very accurate.The price rises when you add quality programming features, such as preset programs that automatically vary the workout intensity by raising or lowering elevation and increasing or decreasing speed. Heart-rate control programs are convenient features that consider the user’s age and weight and keep the exerciser at an intensity sufficient to achieve maximum fat-burning or cardiovascular benefits. Other programming options include incline/grade settings. A maximum grade of 10 percent may challenge beginning exercisers, while experienced exercisers may need a treadmill that reaches a 15-percent grade. Most manufacturers warranty against manufacturing defects only, not normal wear and tear, and if a user weighs more than the machine’s specifications, a warranty may be voided.Many machines come with a lifetime warranty on the frame, while warranties on features and components usually range from 90 days to three years, depending on the machine’s quality. Higher-end machines often come with a one-year in-home labor contract. You can purchase renewable extended warranties that cover everything from parts to labor. Is the machine loud? Do you like how it looks? Does it offer a smooth ride? Is it easy to operate? Remember, this product will be around for a long, healthy time, so determine what you want and need from it before you begin shopping to prevent a regretful purchase. Treadmills provide the most efficient way to burn calories when compared to other popular exercise machines. Researchers asked eight male and five female young adults to exercise on six different types of indoor exercise machines, including a cross-country skiing simulator, cycle ergometer, rowing ergometer and stair stepper. They compared energy expenditure at ratings of perceived exertion (RPE) levels of 11 (fairly light), 13 (somewhat hard) and 15 (hard), and found that subjects who exercised at an RPE of 13 burned approximately 40 percent more calories per hour on the treadmill as compared to the cycle ergometer, which produced the lowest energy expenditure. This brings up the question – Which is better? The simple answer is, it depends. Let’s compare one to the other so we can better form our own opinions. First of all, to some extent oil is oil. All oils are almost entirely comprised of fat (a combination of saturated, mono and polyunsaturated fats) and contain about the same number of calories. Where coconut oil and olive oil differ is in the types of fat they’re comprised of. Coconut oil is predominantly saturated fat (91%) and its remaining 9% is comprised of polyunsaturated fats (6%) and monounsaturated fats (3%). Olive oil, on the other hand, is primarily monounsaturated fats (72%), with polyunsaturated fats and saturated fats evenly sharing the remaining 28%. Why is the Saturated Fat in Coconut Oil Healthy? The idea that saturated fat is entirely unhealthy is somewhat misleading and doesn’t give the whole picture. Lauric acid and medium-chain triglycerides (MCTs), the saturated fats that are specifically in coconut oil, fall into the healthy spectrum. Why is the Monounsaturated Fat in Olive Oil Healthy? That brings us to olive oil. Whereas lauric acid and MCTs are what make coconut oil great, monounsaturated fatty acids (MUFAs) drive the health benefits of olive oil. They key to determining which oil is best for cooking comes down to its smoking point. Why is this important? Once an oil reaches its smoking point it starts to burn, which results in a major loss of the beneficial properties normally provided by the oil. Additionally, burnt oil produces free radicals, which studies show are carcinogenic (can cause cancer cell development) and are harmful in a dozen other ways. Interestingly, because of its saturated fat content, the smoking point of coconut oil is much higher than that of olive oil – the smoking points of coconut oil and olive oil are 350° F and 280° F respectively. Which Oil is Best Overall? These two oils constantly battle it out for the “healthiest oil” award. In the end, both should have a place in your pantry. Aim for variety! Choose which oil to use based on how you plan to cook or prepare. You’ll get the health benefits of both oils while adding variety to the flavor of your cooking. Do you cook with these oils? Which is your favorite?